In addition to training events and tacticals, the Red Guard participates in immersion events each year. What is an Immersion Event? As the name implies, these events "immerse" participants in the scenario. Typically lasting 24 hours or longer, the events include elements like ration issue, guard duty, mail call, in-the-field training, mine laying/clearing, construction of defensive positions, and other such "soldier life" activities in addition to combat scenarios. The events are well balanced and focus on providing a more complete picture of the typical soldier's experience during the Great Patriotic War. Are these events like tacticals? Yes and no. While combat is a key component, the main goal is providing a unique experience for the participants. Combat scenarios are realistic and focus on advancing the scenario rather than "winning" or "losing." Do you always portray the same unit? No. 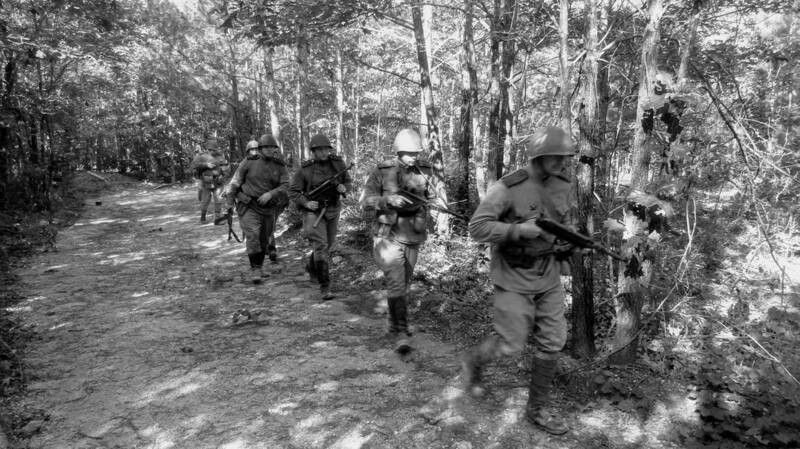 Since event scenarios are set in different regions and time periods of the war, both sides often adjust their impressions to fit the time, season, and troops involved. Portraying different units allows participants to learn about different aspects of the war and increases our appreciation for the sacrifices of the original veterans. How do I get involved? Interested parties should contact Guards Kapitan D. Motowylak by email or the Red Guard command staff on Facebook here. Below are the impression guidelines for the upcoming event as well as the last few events so you can get an idea of the amount of preparation that goes into a good immersion scenario.